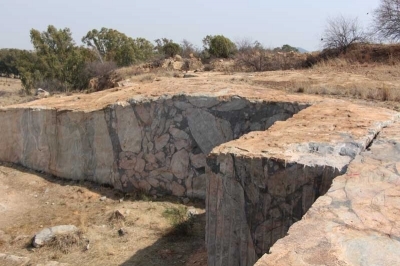 The Vredefort Dome covers the most representative part of the largest meteorite impact site in the world. The crater has a diameter of roughly 300 km, created by an asteroid of 10-15 km in diameter. It was formed over two billion years ago, making it also one of the oldest verified impact craters. The site still shows on the surface geological structures that are the result of the impact. Nothing of the meteorite itself has been found. The Vredefort Dome is one of the most unique sites on the World Heritage List. 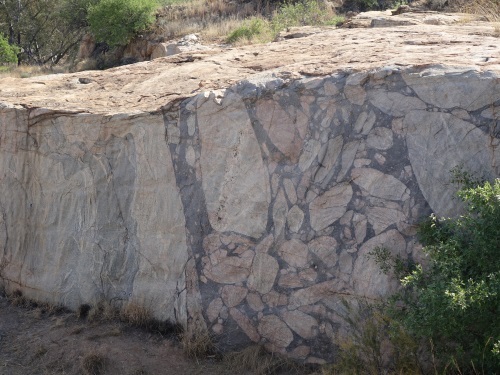 It covers a representative part of what is the largest meteorite impact structure on earth. The structure is also the oldest at 2023 million years (or as some sources say: the second oldest after Suavjärvi which seems to be slightly older). This also makes it the oldest WHS in our Timeline. It’s virtually impossible to comprehend how old this is: the impact happened before our continents split, before most forms of plant life as we know it existed (only stromatolites lived after) and well before animals and humans came into existence. 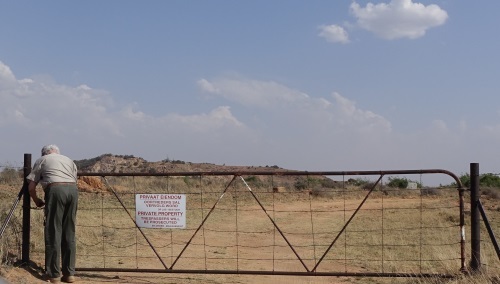 The crater site lies in the Free State and North West Provinces, near the towns of Parys and Vredefort and some 1.5 hours west of Johannesburg. No towns exist in the dome itself, but there are many farms. Almost the whole designated area is private land. That’s one of the reasons that the site is hard to visit. And also you really have to know what to look for: the crater itself is so large (400km in diameter) that it can only be seen from the air. So the focus needs to be on the geological impact of the event that is still visible on the ground. Fortunately there are a few local tour guides who are waiting to share their knowledge. I choose Jan Fourie, who runs private tours from Parys. I opted for the 5 hour version (which ended up taking 6.5 hours), but there are also full-day tours. The tour starts at Jan’s home, where with a cup of coffee at the kitchen table a South African couple and I were shown a powerpoint presentation about the origins of the dome. And – most importantly – about the geological features that are still recognizable in the field. We were promised 5 different 'impact markers', with such difficult names that I probably forgot already 2 of them before we were in the car. The drive along the locations of interest was a slow one: virtually all roads in the core zone are unpaved, and littered with potholes. We weren’t the only ones on the road here: the area is quite popular with weekend guests from Johannesburg, enjoying a family visit, a function such as a wedding or an outdoor adventure organized by one of the many outfitters. Our particular adventure consisted of entering farmland (Jan had all the necessary keys) and look at deformed rocks. The earlier geology lecture came in handy, otherwise it would still be difficult to know what you’re looking at. No part of the actual meteorite has ever been found here. What we did see though were scatter cones (created by the enormous pressure of the impact), black melt rock (even some with rock engravings on it), the hills of the concentric ring structure around the impact site and examples of pseudotachylite. 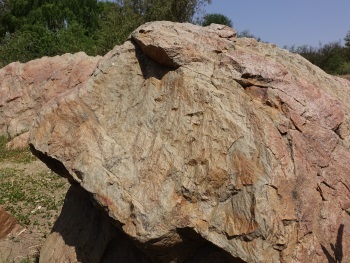 Vredefort is the geological type site for pseudotachylite (i.e. : ‘fake volcanic glass ) – we saw some great examples in a former stone quarry. One of the ‘hidden’ entries along the dusty road gave access to a 19th century gold mine. Its buildings lie left to fade away, its tunnel into the underground mine is still intact. The mining is a product of the meteorite impact too: the impact brought deeper layers within the earth crust more to the surface. Also the drilling has uncovered numerous geological places of interest. 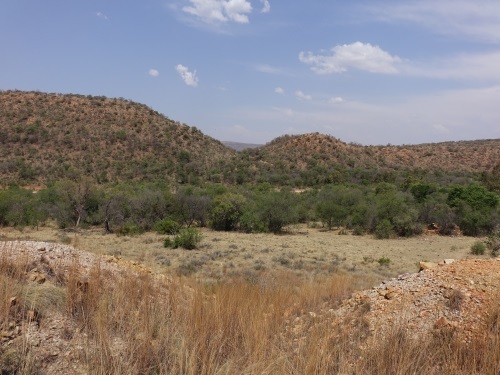 Gold mining rendered too little in Vredefort, but the major gold mines near Johannesburg are a product of the same geological upheaval as well. The state of conservation of this WHS is worrying. None of the locations we visited was protected, however it must be said that they’re hard to find and thus not much in danger of theft or vandalism. The South African authorities use the same defense in their State of Conservation Report from 2013: “… decided not to clearly mark the boundaries of the serial sites in order to better protect them, as it states that their excellent condition is due to their exact locations not being generally known”. It’s a large area, and the land is owned by 149 private farmers. The South African government still has not been able to reach a final agreement with them and assure protection under national legislation. A visitor center has been built, but due to financial issues it was never used and is now crumbling away. There is a small exhibition at Venterskroon, a former mining town in the core zone and possibly the only site easy enough to visit under your own steam. I avoid guided tours whenever possible, but in case of Vredefort Dome it was simply too hard to find out where to go and what to look for. It doesn’t help either that some of the sites are on private land. Being in South Africa for business, I had a day off and wanted to squeeze in Vredefort and Sterkfontein. Off-season, not many tourists visit the region, so I went on a 3 hour private tour with Dome Tour, paying for 4 people. My guide was Prof. Graeme Addison, a very friendly and knowledgeable guy, offering different tours and activities from his ranch (easy to find with google maps from JNB airport). Your own car is supposed to be used for the tour, but as I didn’t have a 4WD I had to spend some extra bucks and we went with Graeme’s car. The tour itself was very interesting. We visited an old quarry and diffent spots that made the enormous size of the crater somehow visible. We also stopped at an old mining village with a small museum. Unlike Cape Town, this part of the country has very dry winters, which granted me an unexpected beautiful and sunny day. Between the places of interest, you pass by animal farms with Giraffes and other exotic animals as well as fields of cashew trees. The region has some natural beauty to offer and overall it was a relaxing and calm experience. Maybe not the most exciting WHS on the list, but surely deserves its spot. I live next to vredefort i grew next to it and i did walked over it for almost 20yrs so all i can say i sthe place is very fine i think the contry should do something about the place. I am particularly worried about the developments that are forcefully intended to take place in the vredefort dome, by landowners of course.As an environmentalist and conservationist I seem to put much blame on the policies governing the WHS, they are definately not protective on these beautiful "protected areas" they intend to protect. The dome is quiet a beautiful place to visit, the landscape,the vegetation, the mammals, birds, the varying climates in the mountains during winter,etc., are a the factors that cannot be destroyed as they occured for a reason, and the history thereof shouldn't just disappear for the benefit of the few rich landowners who aim to get richest at the expence of a beautiful WORLD RECOGNIZED SITE like the dome. The place needs to be fully protected. This includes the Vaal River(the habitat for the endangered Yellow fish) which is extremely polluted.I go in there almost weekly to study the mammals in the area, and I tell you there is a decline in species variety and numbers although the figures are not definite,as yet. The reason for this is one, human impacto. Man can be as dangerous to the natural environment as evil to humanity.People should visit this place and discover the art of nature put to them...and will keep in touch with further comments. This first one was a complaint and I will be more positive soon, but this I will do with the improved involvement of the powers that be. The DOME cannot function all by itself, for evil might be within.